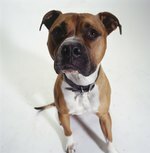 Psoriasis in dogs is characterized by dry, flaky chapped skin which appears in more than one location. It might show up as bright pink, red or silver scaly patches. Psoriasis can become aggravated and infected if the dog repeatedly scratches the skin. Several treatments can help. First, use a process of elimination to determine if any particular item is causing the psoriasis. For instance, dogs can develop an allergy to commercial dog food. Other substances also can cause psoriasis as an allergic reaction, such as shampoo, flea medication, plants, and fabric. Eliminate any substances or products which have recently been introduced to the dog's environment. Use high-quality pet moisturizers to alleviate dryness and reduce itching. Stop the dog from scratching, if possible. Coal tar is commonly used by people for treating psoriasis, and can be used for dogs as well. Coal tar products are available in lotions, ointments and shampoos. Sulfur-containing mud baths can help treat psoriasis, according to the University of Maryland Medical Center. Watch for increased spread of the condition or signs of infection. Take the dog to your veterinarian if the psoriasis worsens.